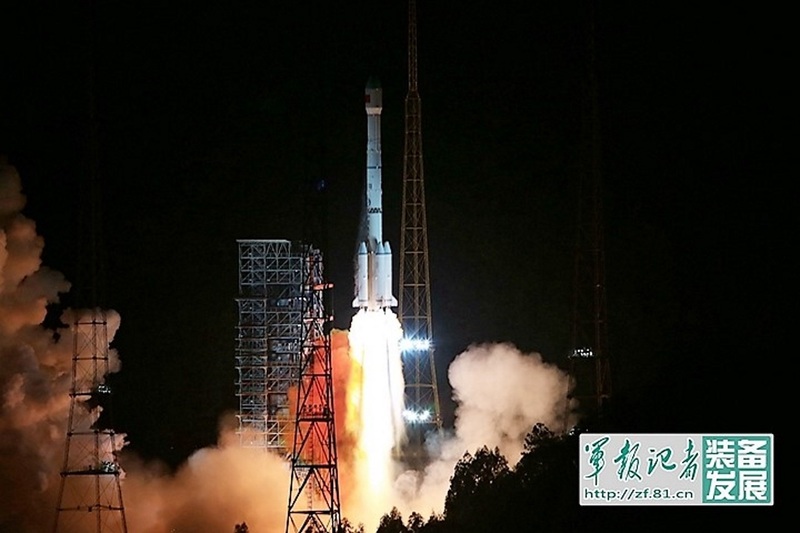 The China National Space Administration (CNSA) sent one of its Long March 3B launch vehicles aloft with the second Tongxin Jishu Shiyan (TJS) satellite to orbit. According to SpaceFlight Now, the telecommunications technology demonstrator had been scheduled to launch late last year (2016). However, it has since been rescheduled and has now kicked off the 2017 global launch manifest. Liftoff took place at 23:18 China Standard Time (10:18 EST / 15:18 GMT) on Jan. 5, 2017, from the Xichang Satellite Launch Center. While not much information has been released about the TJS-2 mission’s parameters, the satellite is said to be similar to the TJS-1 satellite, launched in 2015, which is described as having a mission to test Ka-band broadband communication technologies in geostationary orbit (GEO). China conducted an impressive amount of launches in 2016 – 21 in total – falling behind only the United States in the number of flights that it has conducted. 2017 is also scheduled to be a busy year for both countries, perhaps as busy as 2016. The launch vehicle selected to ferry the TJS-2 satellite on its way out of Earth’s atmosphere is the Long March 3B (it is also referred to as the CZ-3B and LM-3B), which was brought into service in 1996. The Long March 3B rocket launch sites are located at the Xichang Satellite Launch Center (Launch Area 2 and 3) in Sichuan Province. This launch vehicle is typically used to send communications satellites, such as TJS-2, to GEO. The Long March 3B is a three-stage rocket that employs strap-on liquid rocket boosters and is the heaviest variant in the Long March 3 line. At liftoff, the launcher’s core stage with its four YF-21C engines and four strap-on boosters (each utilizing a single YF-25 motor) thundered off the pad to begin a short vertical climb. A few seconds later, the vehicle pitched over and turned southeasterly to fly over the Pacific Ocean and begin its climb to geostationary transfer orbit (GTO). The strap-on boosters provided thrust for about two-and-a-half minutes before being jettisoned. Afterward, the lone core stage continued powering for another 20 seconds or so. The core stage detached after its planned shutdown. The second stage then took over the next portion of the flight and fired its DaFY-20-1 engine for approximately 3 minutes. The protective payload fairing that had protected the TJS-2 satellite through Earth’s dense atmosphere was detached during this phase of the flight as the booster was high enough over the atmosphere to avoid damaging the precious cargo. After the second stage had completed its part of the mission, the third stage performed the longest phase of the flight. With its two YF-75 engines, it performed two burns. One to place it into a parking orbit, and the other to inject it along with the payload into an elliptical geosynchronous transfer orbit. 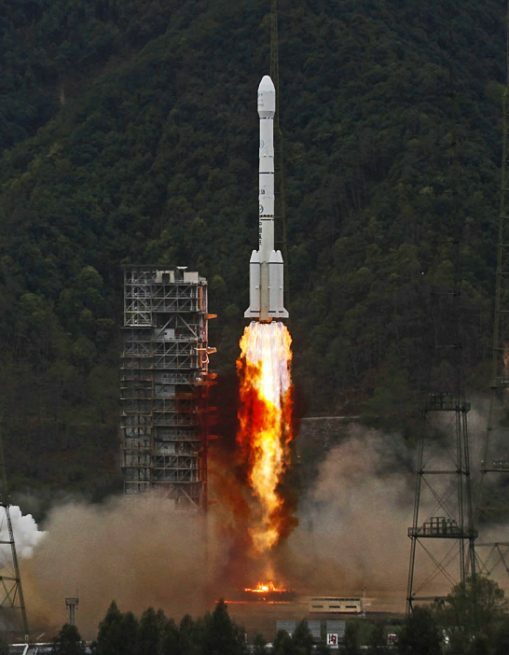 China has been steadily working to improve and expand the capabilities of the rockets it employs; the Long March 3B family is no exception, with an enhanced version – Long March 3B/E – being introduced in 2007. To date, the Long March 3B (and 3B/E) has carried out some 35 successful missions, and one at least partial failure. Thus providing the launch vehicle with a 94.6 percent success rate. The flight of TJS-2 had been slated to take place on January 3; however, poor weather conditions pushed the flight back to today. The launch of the TJS-2 satellite is the start of what could be an unprecedented year of space missions. According to a report appearing on gbtimes, China could be looking to conduct almost 30 launches in 2017.